Sarah Hopkins – cello, shaker (spirit catcher), voice. Recorded: Assembled, recorded and mixed at the Timeroom, Tucson, Arizona. David Hudson recorded in Cairns, Queensland, Australia. Sarah Hopkins and Darwin Didjeridu Mob recorded in Darwin, Northern Territory, Australia. Ambience recorded at Kakadu, Northern Territory and Daintree Rainforest, Cape York, Queensland, Australia. Location recordings were made on a Panasonic Portable DAT SV250. Graphic design: Boelts Brothers Design, Inc.
Just as the mythology of the Australian people and their continent was personified through the complex Aboriginal creation stories called The Dreamtime, the land also gave rise to a rich musical culture unlike any other. 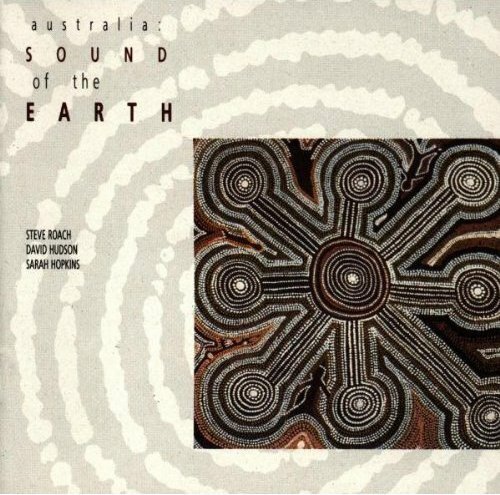 Australia: Sounds of the Earth captures the primordial hums and rhythms that have emerged from and moved across this continent in the four directions, like the winds themselves since The Dreamtime began. This recording features the didgeridoo, an Aboriginal wind instrument of remarkable flexibility and power, in traditional and innovative formats. Virtuoso solos by Aboriginal artist, David Hudson, are complemented by performances of up to four didgeridoo players accompanied by drums and electronics. Tracing the development of an indigenous music firmly rooted in patterns of existence dictated by the rhythms of the land, Australia: Sounds of the Earth embraces Australia’s musical past and present. The riveting performance of cellist Sarah Hopkins, acknowledges the debt 20th century composers owe to the influence of Aboriginal music. By utilizing a combination of bowing techniques and overtone singing, the Australian cellist emulates sounds of the didgeridoo. Producer, Steve Roach, blends the recordings from the outback with their haunting modern echoes by creating evocative soundscapes, and the illusion of a journey through time and space to the origins of these primal sounds.